A Tooltip is available for all buttons listed. FEX functionality is disabled in 64-bit versions of RStat. This is due to the conflicts encountered when calling 32-bit DLLs from a 64-bit application. The Runs a script description has been added for the RScript button. 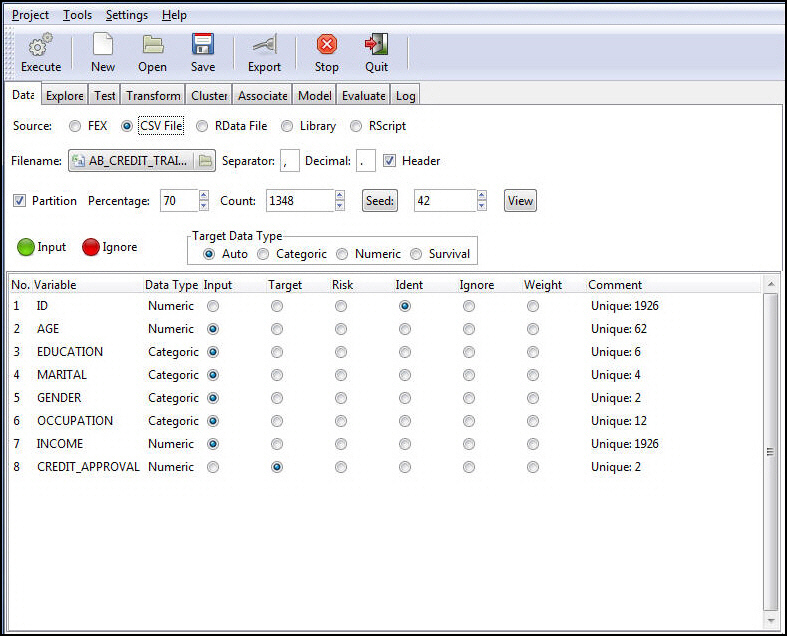 On the Data tab, in the Source area, select FEX, and then click the Filename button. The Select FOCEXEC dialog box opens, as shown in the following image. Select the Reporting Server and application path containing your FEX. The available FEXs are displayed in the right pane. 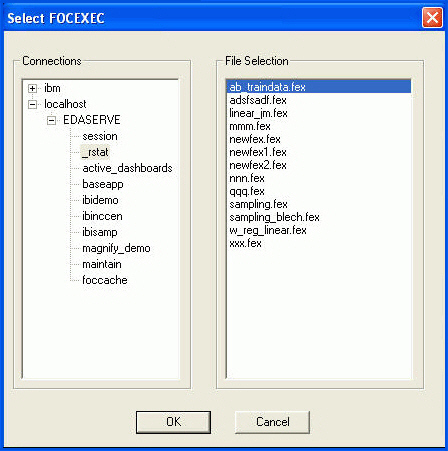 An example of the Select FOCEXEC dialog box is shown in the following image. Select the FEX you want to load and click OK. The file name of the FEX selected appears in the filename control, as shown in the following image. 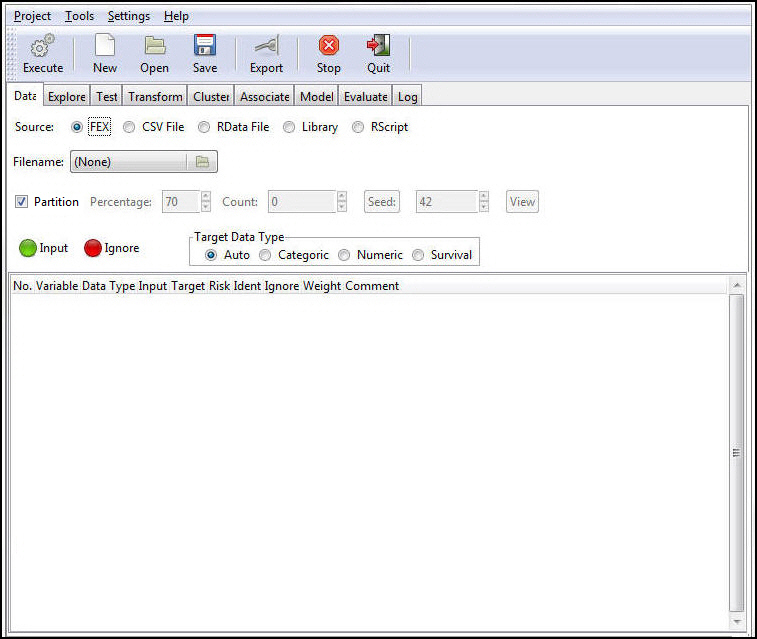 To run the selected FEX and load the data, click Execute on the toolbar. The following image shows the results of running the selected FEX. The FEX load process generates a hold file from the last TABLE FILE (Report Painter or Report canvas object) within the selected FEX. This hold file is named FEXNAME.CSV. In our example, we selected AB_TRAINDATA.FEX and Developer Studio generated and loaded AB_TRAINDATA.CSV. With FEX selected as the Type option, you can see the path of the FEX that generated the CSV. If you select the CSV option, RStat shows that the generated CSV has been loaded, as shown in the following image. 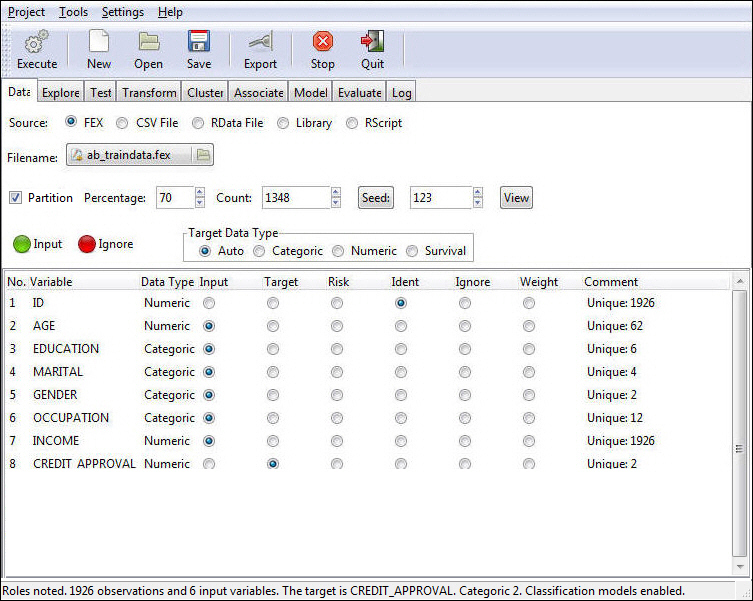 This offers the added benefit of allowing you to access the current data extract in the CSV hold file or to refresh the hold file from the data source by re-executing the FEX. 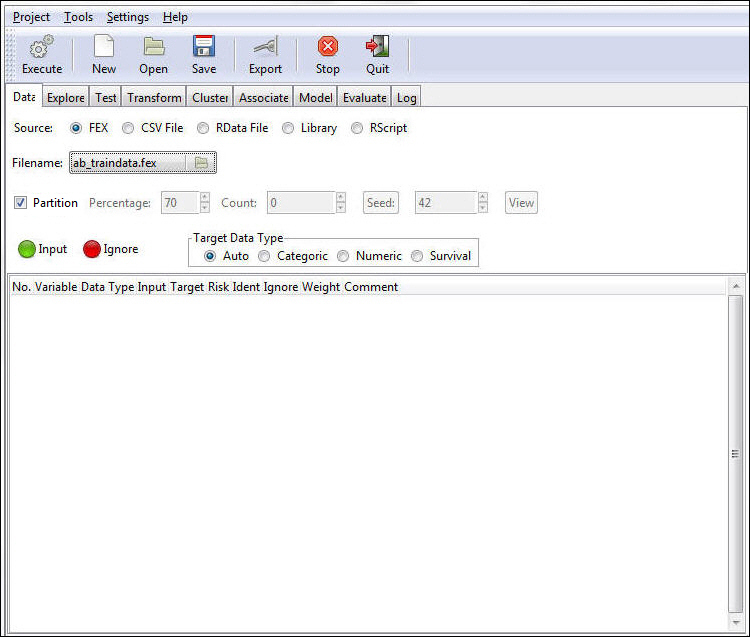 Note: Each time you execute the FEX extract, the existing hold file will be overwritten with the new data extract. If you want to retain versions of the extract, rename it or save the file under a new name. You can use the Export function from RStat to create a copy of the extract under a new name.